washington fly fishing: "October Caddis"
September brought us the Autumnal Equinox, and the Harvest Moon, so named for the farmers of old gaining the opportunity to work the fields well after sundown, harvesting by the silvery moonlight. Imagine what that must have been like; long before diesel tractors and halogen work lights, when the harvest season was most laborious, and entire families would work together, from sunrise to sunset, and into the moonlit nights, harvesting everything by hand. This moon cycle is an annual harbinger of the great turning of things, the endings and beginnings of seasons, life cycles, migrations- all dependent upon sunlight. For our Pacific Northwest wild Salmonids- Salmon, Char, sea-run Coastal Cutthroat Trout and Steelhead- the change of light portends their return to natal waters. A time of completion and closure that shifts subtly, each day, with the tilting axis of the earth. Good things come after the Harvest Moon. Here on the Olympic Peninsula rivers and creeks the sea-run Cutthroat are once again moving up into fresh waters from the saltchuck. Not all at once, but a trickling few fish, here and there, through late summer and fall in almost every significant system that hosts them. And more waters hold these wild trout than most anglers know of. Along with the Cutthroat are our few wild resident Rainbow Trout, though the regional biologists refer to them as "Risidualized Steelhead". And summer run Steelhead fishing is an opportunity here now as well, as the bigger glacially influenced rivers have receded to lower flows and clearer visibility. Dawn and dusk may afford the best circumstances for some runs, while mid day fishing in shaded water can be productive. 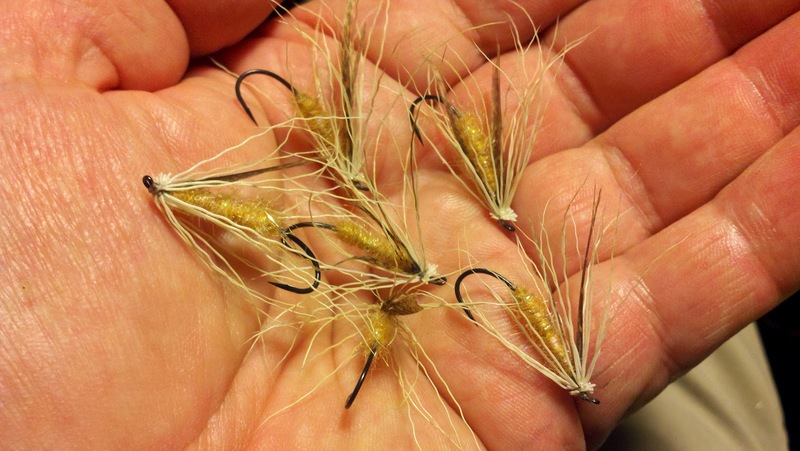 Stealthy, quiet presentations, longer drifts, greased line presentations, stalking holding fish in the deeper pools, wet flies, soft hackles, Steelhead Caddis etc. It is all about not letting them see you or hear you. In low water and daylight your presence will likely distract them, enough to stop them cold. Our fall salmon are also arriving this time of year, Coho, Chum and Kings, a few early fish, then a run of them that may last well through November. We all hope for the salmon. The salmon are hoping for rain. Only time will tell. But they too are gathering now, toward the mouth of a river, lying out there beneath the surf, in the moonlight. Waiting. The first good pulse of rain, when it comes, will carry them in on cool rising flows, an autumn freshet from the mountains to the sea. And the run will be on. In any case, we don't have to wait for the rain to go fishing. Dry line fly fishing for Cutthroat and Summer run Steelhead is often superb this time of year, and under precisely these low water conditions. Here is my own sparsely tied variation on the theme of the October Caddis. This is a prolific autumn hatch that we will see on almost every stream and river here, right into the hard freeze we usually get near November. I like to skate and drift this fly on the surface, greased a bit to aid in flotation. But this fly will work beneath the surface, just, and sometimes that is enough. And it has worked well, catching fish on the swing. 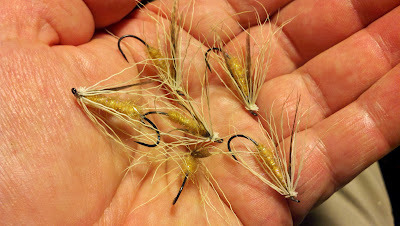 I use this fly in saltwater too with good results on sea runs. And let us not forget that some of the best sea run Coastal Cutthroat fly fishing of the year is still going on in our salt waters; across the north coast, on the east end of the Olympic Peninsula and south into Hood Canal and Puget Sound. Some years we will fish for them in the Saltchuck right through Thanksgiving. The fish in the photo below was caught on one of my favorite saltwater Cutthroat flies: "The Muddler Minnow". Greased and stripped across the surface: Shake, Twitch, Wiggle and Pop! Master on the fly Leland Miyawaki, fishing dept manager for the Orvis Bellevue Store, conjured up this shallow running Coho on the beach here last Friday, using his magical Miyawaki Beach Popper right on the surface, under a bright sun, in the late morning on an ebbing tide. Shifting To Neutral, or how to get worried.